When in auto mode, the CirQulate System provides optimum filtration, based on the air quality in your home. The air400’s PM 2.5 sensor measures the concentration of particles in your home’s air then shows your home’s air quality in real time on its air quality feedback display, making your once invisible concerns visible. • 3–Stage Filtration System – includes a pre-filter, a 1” thick activated carbon filter, and a High Efficiency Filter which captures 99. 7% of microscopic particles on silent mode including dust, pollen, smoke, and pet dander. Great for homes with pets, babies, or young children. Most ideal for those who suffer from seasonal or non-seasonal allergies or those who just want fresh, clean air in their home. • Smart CirQulate System – uses a particle sensor to continuously monitor your indoor air, adjusts the air400’s speed of air flow accordingly, and provides real-time feedback on the front digital display. No more wondering if your air purifier is working! 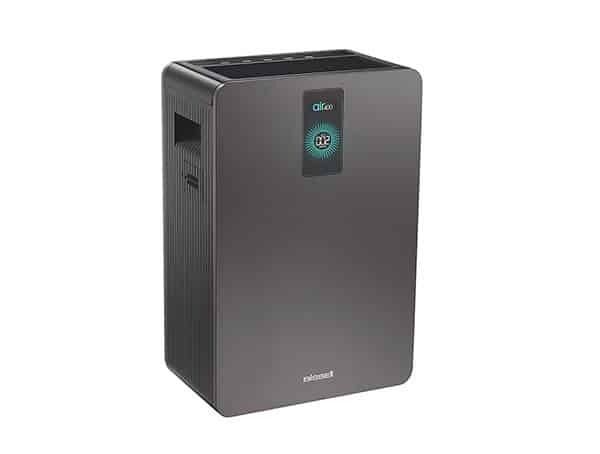 • POWERFUL PERFORMANCE & THOUGHTFUL DESIGN air400 is powerfully equipped with a large fan and long-lasting, quiet, digital DC motor. Built to blend right you’re your home with a neutral tone, clean edges, and sleek design. • Library Quiet Air Purification – The air400 has an automated dimming night mode and provides the air purification at noise levels as low as 30 db(A) on silent mode.